Liquid biofuels are increasingly being used across the globe, either as an additive that helps to reduce carbon emissions or as a direct “drop-in” substitute for gasoline. A research team from MIT and the Cambridge startup Novogy has developed a new microbial engineering technique that may considerably reduce the environmental impact and cost of creating biochemicals and liquid biofuels as substitutes to petroleum-based products. 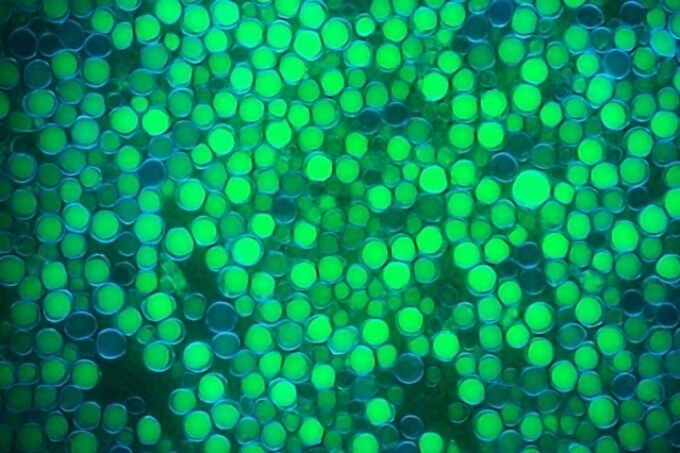 This latest method, in addition to reducing cost, can potentially reduce cost and remove the necessity for antibiotics during the production of biofuels. Microbes are typically used to produce chemicals and fuels to change sugars, derived from cellulosic plant mass, sugar cane, or corn, into ethanol and other related chemicals through fermentation. This process is quite expensive, and as a result developers have been attempting to scale-up biofuel production to large-scale manufacturing levels in a more cost-effective way. The contamination of fermentation vessels with other superfluous microbes has been a major source of concern for producers, because both yield and productivity are reduced when these microbes vie for the producers’ microbes for nutrients. Most microbes are sensitive to ethanol, except for the yeast Saccharomyces cerevisiae, which is used to produce this gas. The yeast naturally prevents the contamination of the fermentation process, but this is not the case when it comes to producing superior biochemicals and biofuels. In order to destroy the unwanted invaders, companies either have to use costly antibiotics or steam sterilization, which involves fermentation vessels to be made from expensive stainless steels. However, when large numbers of bacteria are exposed to these antibiotics, it leads to the manifestation of tolerant bacterial strains, which in turn can add to antibiotic resistance - a growing problem in the world. The new technique developed by the researchers give the producer microorganisms the upper hand against the invading microbes, removing the requirement for potentially harmful and expensive sterilization techniques. The study has been reported in the Science journal. The researchers cultured Escherichia coli, a type of microbes that are capable of extracting two critical nutrients, phosphorous and nitrogen, from unusual sources which could then be introduced to the fermentation vessels, as reported by Joe Shaw, senior director of research and development at Novogy, who headed the research, and Gregory Stephanopoulos, the Willard Henry Dow Professor of Chemical Engineering and Biotechnology at MIT. Both phosphorous and nitrogen are required for growth. Also, the engineered bacterial strains possess a unique advantage: when they are exposed to these unusual chemicals, there is less chance of them escaping and growing uncontrollably beyond the plant in a natural setting. We created microbes that can utilize some xenobiotic compounds that contain nitrogen, such as melamine. Melamine is an artificial or xenobiotic chemical, which includes 67% nitrogen by weight. Ammonium is often used by traditional biofermentation refineries to supply microorganisms with a nitrogen source; however, contaminating microbes like Lactobacilli also have the ability to remove nitrogen from ammonium, enabling them to grow and fight with the producer microbes. These organisms, in contrast, do not possess the required genetic pathways to use melamine as a source of nitrogen, says Stephanopoulos. “They need that special pathway to be able to utilize melamine, and if they don’t have it they cannot incorporate nitrogen, so they cannot grow,” he says. The researchers used a unique artificial six-step pathway to engineer E. coli. This method allowed the microbe to express the required enzymes to change melamine into carbon dioxide and ammonia, in a strategy which the researchers called ROBUST (Robust Operation By Utilization of Substrate Technology). The researchers then experimented with a combined culture of a naturally occurring strain and the engineered E. coli strain and observed that when engineered type was fed on melamine, it overcame the control quickly. Following this, they attempted to design the yeast Saccharomyces cerevisiae to express a gene, which enabled the microbe to change cyanamide into urea, from which it can extract nitrogen. Cyanamide is a nitrile-containing chemical. Subsequently, the engineered bacterial strain was able to grow with cyanamide as its only source of nitrogen. The researchers finally engineered the yeast Yarrowia lipolytica as well as the S. cerevisiae to use potassium phosphite as a phosphorous source. They observed that feeding these engineered yeasts on these chemicals allowed them to outcompete the naturally occurring strains, just like the engineered E. coli strain. So by engineering the strains to make them capable of utilizing these unconventional sources of phosphorous and nitrogen, we give them an advantage that allows them to outcompete any other microbes that may invade the fermenter without sterilization. The researchers successfully tested the microbes on a wide range of biomass feedstocks, such as sugar cane, cellulosic hydrolysate, and corn mash where they did not show any loss of productivity as opposed to the naturally occurring bacterial strains. According to Jeff Lievense, a senior engineering fellow at the San Diego-based biotechnology company Genomatica who was not part of the study, the innovative method will enable companies to choose their productive microorganism. “In theory you could operate a fermentation plant with much less expensive equipment and lower associated operating costs,” Lievense says. “I would say you could cut the capital and capital-related costs [of fermentation] in half, and for very large-volume chemicals, that kind of saving is very significant,” he says. Shaw added that the ROBUST strategy is ready for industrial assessment. The method was developed in collaboration with Novogy scientists, who already tested the engineered bacterial strains in the laboratory and conducted trials with large 1,000 liter fermentation vessels, and also with Felix Lam of the MIT Whitehead Institute for Biomedical Research, who headed the cellulosic hydrosylate testing. Shaw informed that Novogy is hoping to use the technology in its own state-of-the-art production of biofuels and biochemicals and is keen to license it for use by other producers.